With a combination of fragrant Thai spices will definitely blast some flavour into your grilled veggies! Place the coriander, garlic, fish sauce, water, pepper, chilli-garlic sauce in the bowl of a food processor; pulse to form a paste. With the processor running, pour the oil through the lid spout in a slow stream. Use a spatula to scrape the marinade out of the processor and pour it over the vegetables. Toss well, cover, and refrigerate for 1 hour. Meanwhile, prepare a charcoal grill for medium heat. 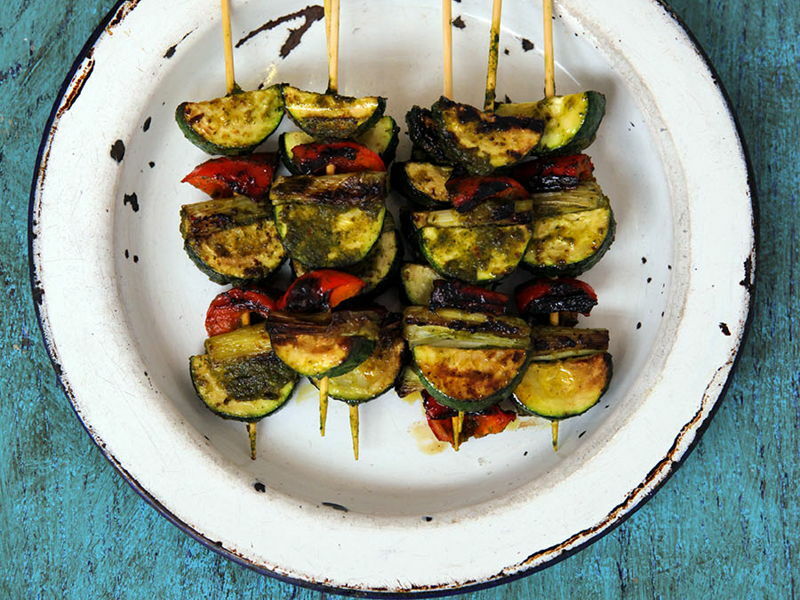 Thread the marinated vegetables onto metal skewers (or wooden skewers that have soaked in water for 30 minutes). Grill the skewers for 12-15 minutes, turning frequently to prevent burning, until tender and browned around the edges. Serve with rice, noodles, or as a side dish!